Well one the last part, we looked at the science behind making pruning cuts and best ways of pruning using secateurs and loppers, this week we shall look at using the power horse of hand tools, yes the pruning saw! So what is a pruning saw and how does it differ from say a carpentry saw? Well it’s a much stiffer blade that those types of saws and most of the time cut on the pull. Some can be folded up to fit into your pocket or a fixed blade. Pruning saws are used to prune anything bigger than 15mm and up to well as big as you can cut! 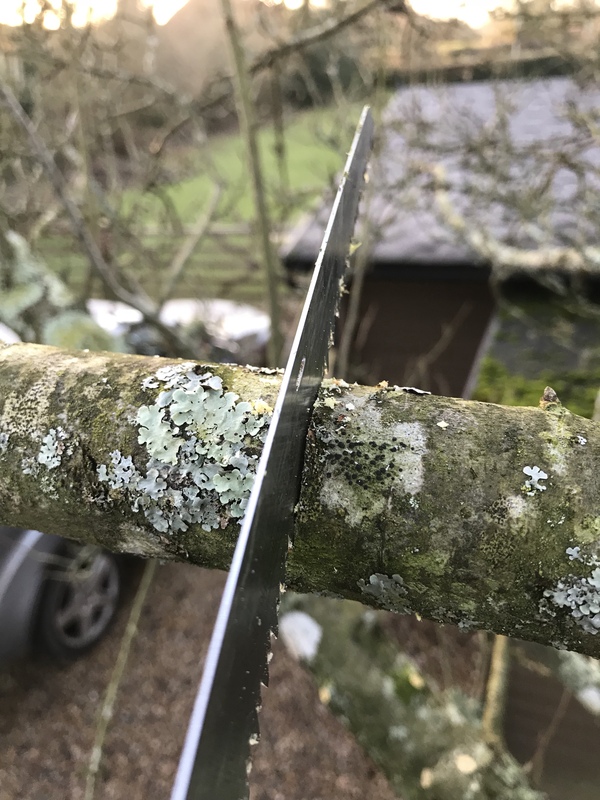 A bit like using secateurs, theres no right or wrong ways but there’s always better ways to reduce damage or risks to the tree or plants. First thing is to get the sharpest pruning saw you can get with a sharp clean blade, over the years I have found Silky pruning saws the sharpest and even with these, I tend to change the blade every year so I am using the sharpest I can. Now the angles of cut depending if the buds are alternate or oppersite are the same as for using secateurs on wood up to a couple of years old but they are a little more difficult to see in the older wood, almost looking for wrinkles in the Wood is almost a sign that buds are there hidden. That said in wood over 25mm thick, I prefer to do a straight cut across. The reasons are simple, the surface area on straight cuts are much smaller than cuts made at an angle, which means the plant has a smaller area to heal over. That even means on the junction of bigger branches. The pruning cut on these bigger branches to the main stem used to be done at an angle on the stem, the angle of the cut was always done just above the ridges or collar on the stem. It was thought these would heal quicker but it’s not really the case as the straight cut will heal a lot sooner. Thank you for explaining this. I do not have the patience to take such pictures.